Gingivitis is a disease that causes inflammation and infection of your gums. If it is not treated, it can lead to tooth loss. Gingivitis develops when the bacteria in plaque -- the sticky, colorless deposit that is continually forming on your teeth -- multiply and infect your gums. You may first notice inflammation, but as the bacteria continue to attack your gums, pockets begin to form that loosen your teeth. Gingivitis may be painful, even when you have a milder form of the disease. If you notice the symptoms of gingivitis, see your dentist immediately. You can also decrease the inflammation and pain of gingivitis while helping your body fight the infection. Gingivitis does not always cause pain, so you may not know you have it. If your gums are puffy, swollen, receding or reddish, you may have gingivitis. You may notice a red or pink color on your toothbrush or floss, indicating that your gums bleed easily. Some people with gingivitis also have bad breath. If your gingivitis is not treated, it can spread to underlying bone, which is a condition called periodontitis that can lead to tooth loss. Periodontitis can also affect your general health and increase your risk of heart attack, stroke or lung disease. Women who have periodontitis may have an increased risk of delivering premature babies or babies with low birth weight. Gingivitis is usually caused by poor oral hygiene. Remove plaque every day by brushing and flossing because it re-forms quickly, usually within 24 hours. If you leave plaque on your teeth longer than two or three days, it will harden under your gums to form tartar. A dentist or dental hygienist remove the tartar with a professional cleaning. A saltwater rinse may help soothe your sore gums. Dissolve a half teaspoon of salt in a cup of warm water. Swish the solution around your mouth very well for about a minute so it reaches between your teeth and into the areas that contain the infection. Hydrogen peroxide mouth rinse is also often recommended to get rid of dead or dying gum tissue. Chlorhexidine gluconate is a mouthwash your dentist can prescribe that kills mouth bacteria and is used to treat gingivitis. Swish it in your mouth for at least 30 seconds, then spit it out. Chlorhexidine gluconate may leave a bad taste, but don't rinse your mouth after using it. Your dentist may advise you not to eat, drink or brush your teeth for two hours after using the chlorhexedine mouth rinse. Chlorhexidine gluconate might stain your teeth, dentures, tooth restorations, tongue or the inside of your mouth, so ask your dentist about how to remove the stains. 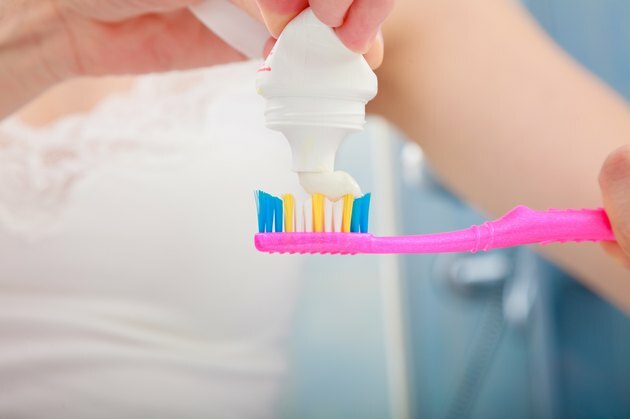 Treat gum pain from gingivitis by using a topical ointment or gel available at your local pharmacy under several brand names, such as Anbesol, Orajel and Anacaine. The over-the-counter product should be marked as an oral product and contain benzocaine, a topical anesthetic that can temporarily relieve pain. Apply the product directly to the irritated areas of your gums. Follow the usage recommendations on the product label carefully, because benzocaine has been linked to a rare but potentially lethal condition that decreases the amount of oxygen your blood can carry. Over-the-counter anti-inflammatory medicines may help to relieve the pain and inflammation of gingivitis. Nonprescription ibuprofen is one such medicine in a class of medications called nonsteroidal anti-inflammatory drugs, or NSAIDs. These work by stopping your body from making a substance that causes pain, fever, and inflammation. NSAIDS may cause some side effects, such as constipation, diarrhea, intestinal gas, ulcers, lightheadedness, nervousness or ringing in the ears. Tell your doctor if you have any unusual problems that worsen or do not go away while taking ibuprofen. Other common over-the-counter NSAIDs include aspirin, naproxen and ketoprofen. Why Do My Teeth & Gums Hurt?